So much of what’s important to me involves people, so I find that I listen to a lot of presentations and workshops on relationships with people. And, like many of you out there, I wanted to move beyond stick figures (which are perfectly acceptable, by the way!) but didn’t know how. Then I found some simple people forms that I could create easily and quickly. So, this lesson is all about drawing simple people. 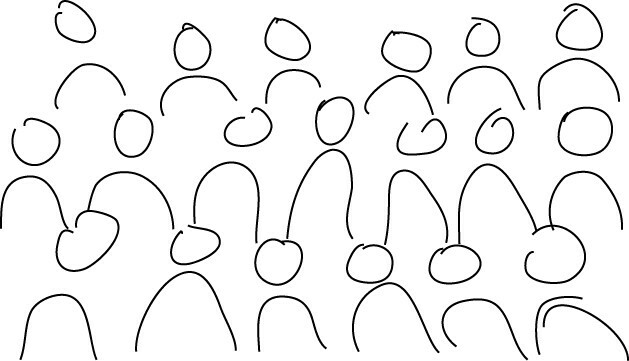 There are several simple people forms that I’ve seen used in Sketchnoting and in graphic recording. Here are a few. Any time you are drawing people, it’s easier to get them close to proportion if you add the head last. The arms and legs are four points of a five pointed star and the head makes the fifth and top point. Here’s the process. 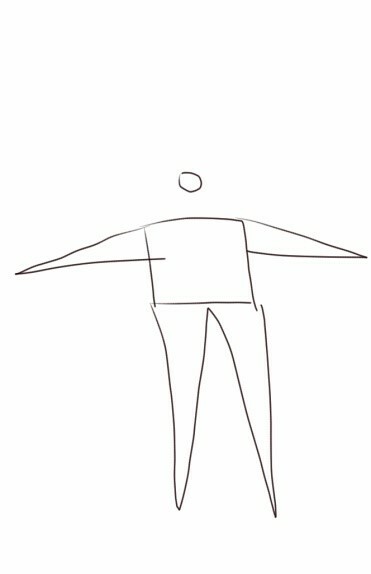 Draw a square for the torso, the middle of your person. 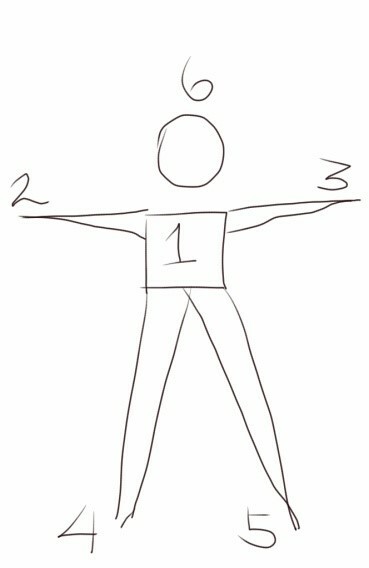 Draw two dots out parallel to the top of the torso for where the arms will end. Draw two dots about a third of the way down the torso box. These are armpit throw lines. Draw two dots parallel to the left and right side of your square, about twice as far away as the arm dots. These are leg throw lines. The crotch throw dot is the mid-point of the bottom torso line. Now throw your lines between those dots. Add a BIG head. You have a child. To make it look more like a child, draw the features REALLY low on the face. Add a teeny head. You have a giant. The capital M is the torso and arms. The W is the legs. 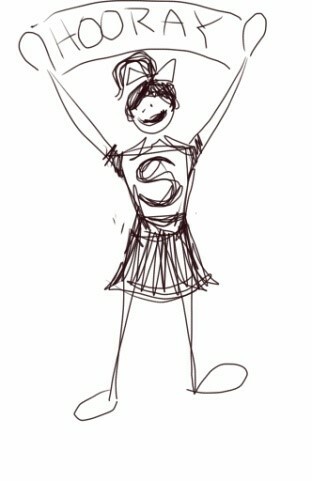 Draw a skinny W about twice as tall as the M.
Let’s play with the star person to add more context. 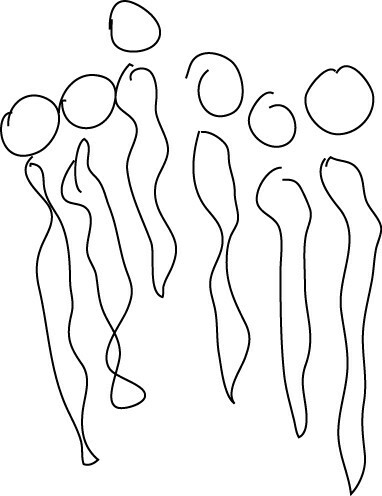 Draw four torsos. On the first, add a left arm throw dot above the head. 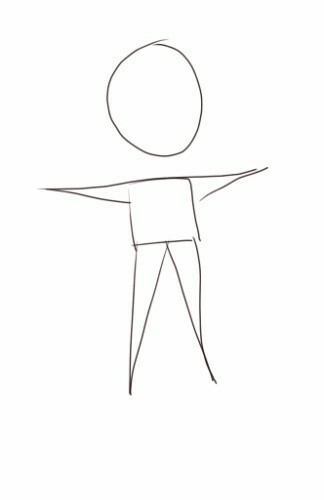 On the next, add the left arm throw dot a little ways out but down, next to the torso. Throw your lines. The arm will point down. Add the right arm throw dot a bit above the shoulder. The arm will point slightly up. Throw your lines. Add a pointing finger on the raised arm. Make your star person jump, dance, run, move, sing, talk. Think about what arms and legs do. Have a partner pose for you if you’re not clear. How could you reshape your MW person? One more person type, one that is very familiar. 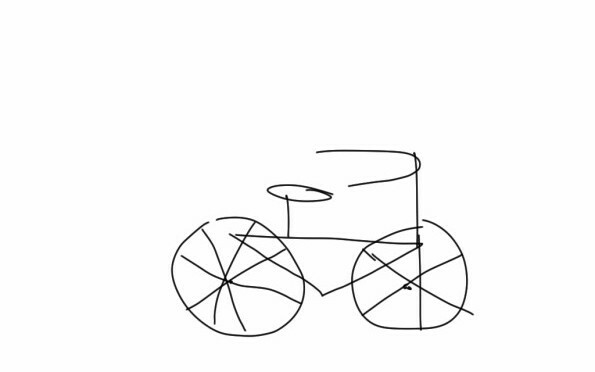 Draw a stick figure doing something. 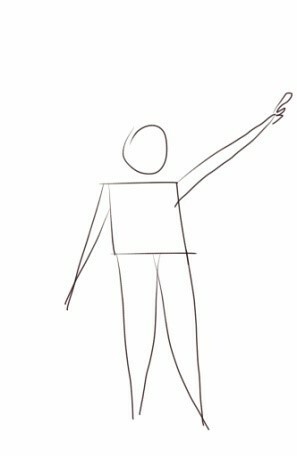 An action stick figure has three parts to it. . . the arm positions, the leg positions and the body position. The easiest way for me to get the stick figure right is first to capture the body position, using what cartoonists call the Action Line. That’s essentially the spine extended from the feet through the top of the head. 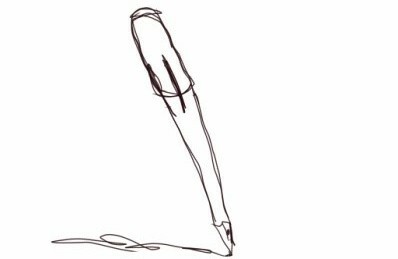 Draw an action line that is hunched over. We’ll think of this figure as looking at something on the ground. In the middle of the action line, draw a curved box to represent the body. Now anchor the body to the ground with the feet and legs. Add the head, with the nose pointed toward the ground. Now think about what the arms might be doing if your figure were falling over. How about looking at something through a magnifying glass? What does the action line look like for a running figure? Look at the spine. Which way do the arm and leg joints go? Now stick figure the running person. You know what the faces look like to convey emotions. What does the body do to convey a depressed person? You really don’t have to convey an entire catalog of emotions in your sketchnoting. Just concentrate on the big ones. So, you’ve got these great stick figures, with box bodies. A word about the box body. From the front, the legs go on the outside of the box; the wider the box, the wider the stance. 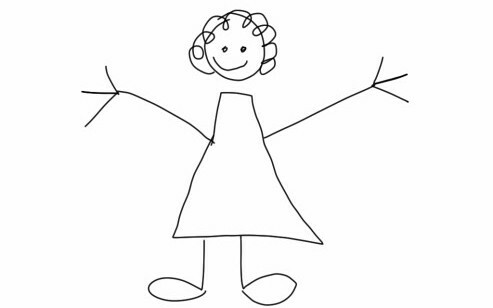 You can dress your stick figures by going over your stick lines to add weight – pants, shirts with stick arms sticking out. Dresses, heck, even ball gowns. Dress three of your figures up right now. What if you want to create more than one person? What if you want to represent a crowd? You don’t have to draw individual figures. 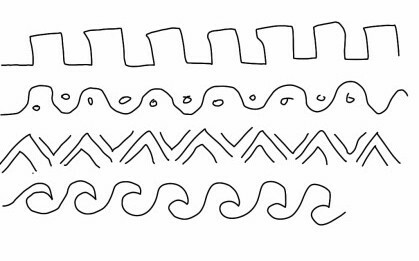 Massive crowds – doodle long skinny wiggles as open forms, standing close together. Add a small head on top. Place loads of them together. At a conference – you’ve seen these. Rows of upside down U’s with circles on top to represent us sitting at a conference. I use them sitting around a table too, to represent meetings. And I almost forgot the actual practice. 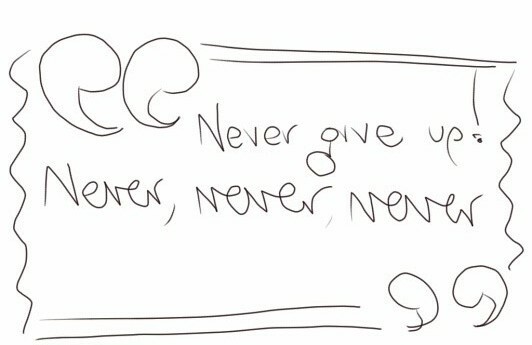 Try this talk to sketchnote now and use your people. I had scheduled these posts to publish every Monday and trusted that that was exactly what was happening. Ah well! So here is the next lesson, one right after another. But, the great thing is that you are working at your own pace so you can complete the lessons when you want to. What have you drawn already today? Here are some ways to set up your sketchnotes so that they make sense all the way through. As you read this lesson, think about what kinds of images you might create if you were listening to it. 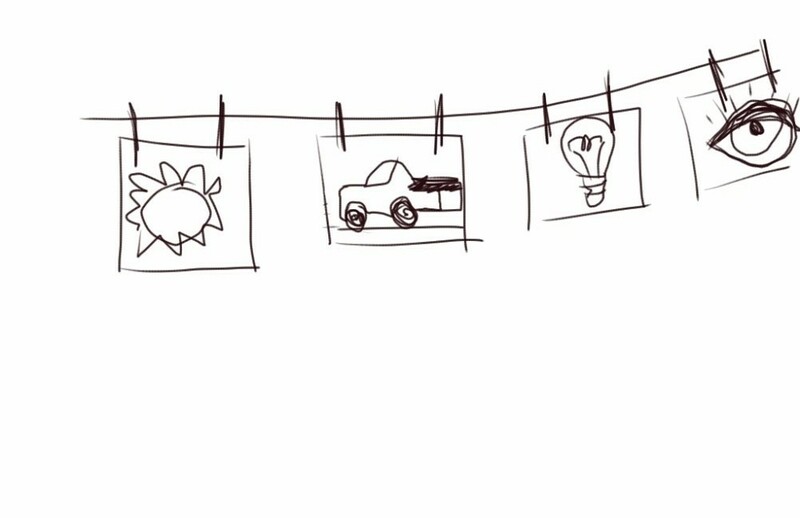 Each sketchnoting experience adds to your visual vocabulary. Deep listening is like moving deeply into a pool. Think about what happens to outside sounds when you sat on the bottom of the swimming pool as a child, how they were damped and far away and you were totally with yourself. Listening as an immersive experience. You’ll find that if you have really listened to a speaker, you’re tired afterward. Real listening is active. You are actively connecting new information to what you know; what is already familiar. I’m going to cover 12 points on how to listen. The first three are about uncovering the form or structure of what you’re about to experience. The next five are about presence and the final four are practical tricks for quick payback. Don’t miss the introduction. There are clues in it about what is going to happen. The introduction gives you a great opportunity to map out a framework on your page. Begin to pay attention to common structures –People who present often follow a defined structure. Learn to recognize structures. Here are four pretty common ones. The structure of these lectures are all how to. They’re assembly instructions, like how to put together a bicycle. Listen for clusters of ideas. A speaker may present all of the main ideas upfront and then add detail to each one, or they will present a main idea and then details followed by the next idea and details. When you hear clusters, you know where to collect relationships of ideas. Process in real time — We are always looking for places to make more sense out of what we already know. 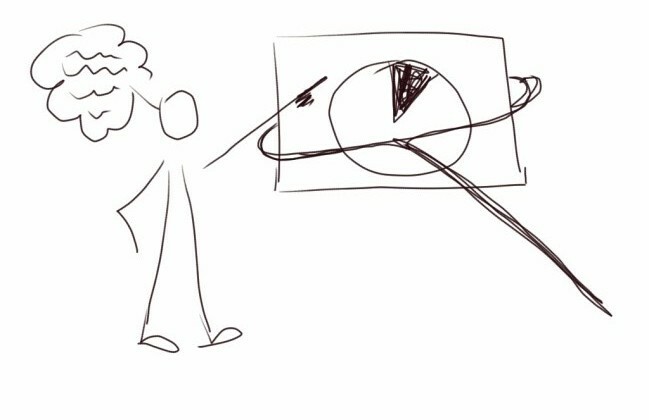 Think, all the while drawing, about what the speaker is saying that changes, expands, improves on what you know, about this topic or in other domains. For example, you might know something about knitting that becomes increasingly clear during the beginner’s presentation on string theory. Well, you know what I mean. Be curious – If you’ve bothered to attend, you believed that the speaker would say something that was important to you. Listen without judgment. If you can’t manage that, channel your inner alien the way you do to get through holidays with your family. Well, you know what I mean. Don’t start the internal argument of why he or she is wrong. Quiet the voice in your head. Focus your attention on the content and not on the presentation style. Tune out distractions – and while you’re at it, quiet the voice or voices of the persons sitting beside you. If the conversation next to you is interesting enough to pursue, trade business cards for later. Or leave. Sometimes those next seat conversations really are more interesting. But that’s not the reason you’re there. Or is it? Don’t capture what’s obvious to you unless you need it to complete the picture. Or unless you’re bored. 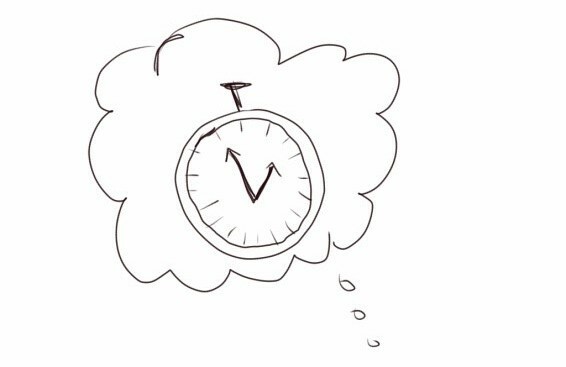 Sketching is a great way to get value out of an experience that becomes less than optimum. Use punchline quotes to capture the spirit. There are always one or two or three quote phrases that capture the Ahas! As well as conveying the sense of the presentation. Capture them. Set them off in their own spaces with large quote marks to call attention to them. Hijack the speaker’s visuals If the speech is accompanied by a Powerpoint slideshow, and these days which aren’t, consider which images from slides you might want to recreate for your own sketchnotes. Thumbnails are enough. Repurpose your rubber stamp images. Use the collection. A light bulb can be used to designate any idea. 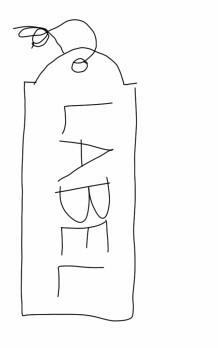 Just add a label. The circle slash? A box, a funnel, etc.
? What rules really resonated with you?
? What rule seemed to be missing?
? What would you add to your notes now? Add it. This is a great YouTube video on graphic facilitation, which is sketchnoting to capture what is going on with a group. The principles apply to individual sketchnoting as well. Bring it up and sketchnote along. 1. Draw like a child, not only simply but with abandon and joy. This is fun stuff! If it’s not fun, you’re not doing it right.Draw over and through. 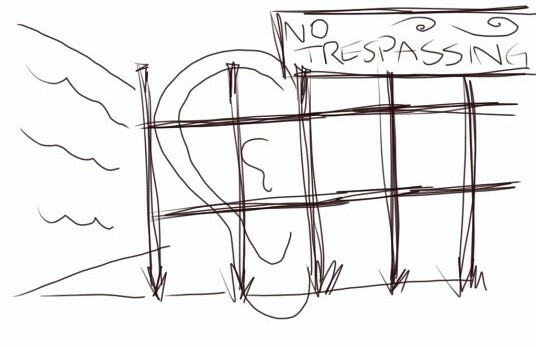 Don’t worry about overlapping lines. 2. Pick out key words. Sometimes illustrate key words and phrases is enough for memory. Try pulling some out from this mini-lecture. 3. Use connectors and dividers to configure your space and your ideas on the fly. Make them interesting shapes and patterns. Build your library of these line types. 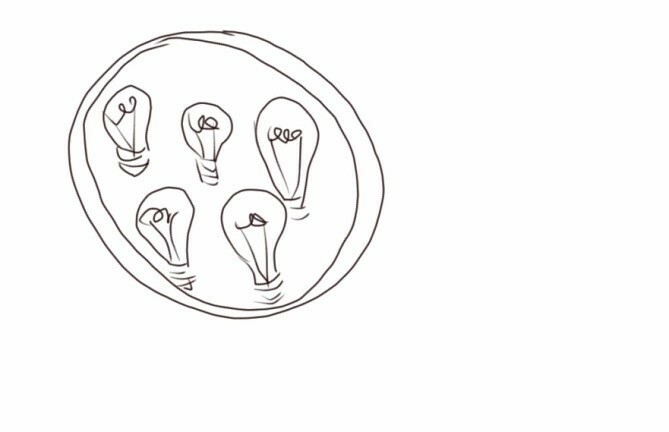 These are the easiest ways to add interest and emphasis to your sketchnotes. 4. Draw the essence. This is true of both subject matter and illustration. You might not need the entire bicycle if the handlebars will convey the idea. If the talk is about world hunger, capturing a startling fact by a bite out of a globe with a percentage might be all you need for that point. 5. Focus on recognition and not resemblance. You’re really creating symbols for meaning; you’re not creating a court scene for broadcast. Simplicity counts, especially if it’s elegant. Aim for elegant simplicity. Settle for something much less. And settle quickly. 6. Rubber stamp images – very quickly you will develop (or maybe you already have) a set of symbols that you use all the time. These are symbols that have become so simple for you to create that you almost rubber stamp them on the page. Grow your stamp collection. 7. Use text labels if you need something fast and you can’t come up with an image. Learn to create simple block letters or script that looks good and can be read easily. Then build your hand drawn letter sets. Try italics or bold. Mix it up on the page to make it interesting. Heck, mix it up in the sentence. 8. Adopt visual metaphors — Our language is full of visual metaphor. Go ahead. Adopt them. Or some version of them. 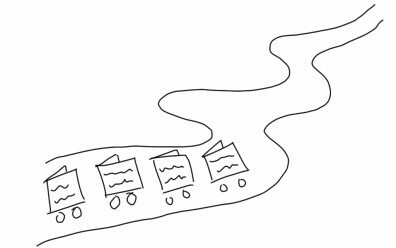 How might you sketch the Information Highway? How about customer centered? Or mapping an approach to a problem? Across the board? Throw the baby out with the bath water? Ready for your first lecture? This will be familiar to those of you who took the Hendricks 3-Day Essentials course. The nice thing about practicing with lectures online is that you can go back through. Shake your hands out to loosen them up. Ready. . . Set. . . Draw! Learning to sketchnote is a lot like learning to read. Remember how each new word added to your ability to read more quickly and more deeply? The same is true with sketchnoting. 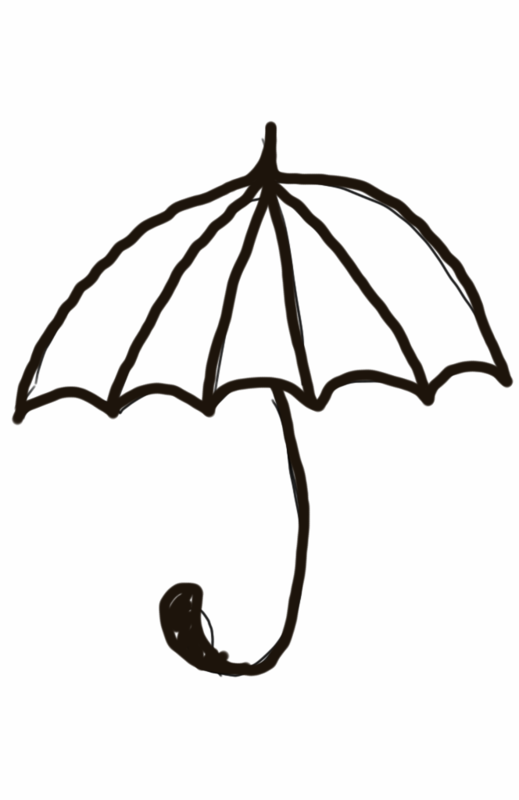 Each image that you add to your symbollary will allow you to sketchnote more proficiently. Let’s start now building a beginning library. Do not spend more than 30 seconds to a minute creating an image for each word or phrase. Do not spend more than 30 seconds to a minute creating an image for each word or phrase. Move through the entire list. Think about what you drew as a child. Those images are great symbols. 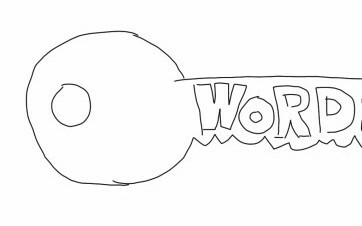 After you have drawn a symbol for each word or phrase, go back and look at what parts of your drawing make up the ESSENCE of each symbol. What is the simplest way to represent the concept behind the word? Draw each of your NEW symbols now.